My first of three years as a TESL Ontario board member will be coming to an end soon, but it feels more like the beginning of what is turning out to be a rewarding professional opportunity. 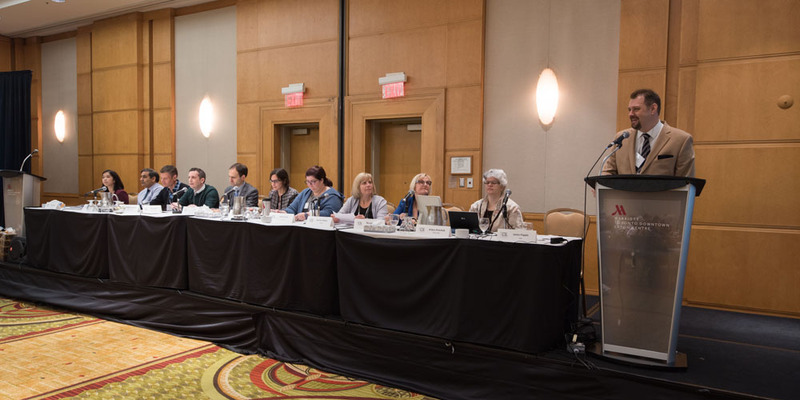 I’m writing this blog entry to share with you why I feel so fortunate to be a member of this board, and why I recommend that you, my OCELT colleagues, consider applying to be a member of the TESL Ontario Board of Directors. I hope my positive experience will convince you to take action. The call for nominations is open until June 11 at noon. To get started, head to our board recruitment info page: http://www.teslontario.org/board-recruitment. Attending my first meeting was a little nerve-wracking but rewarding. This was one of our three face-to-face meetings this year (the rest are online), and it took place at the 2017 TESL Ontario conference. It was an informative and well-organized session, and I’m thankful that my fellow board members reserved judgement while I maneuvered awkwardly through the meeting formalities and pretended that new acronyms could roll off my tongue with ease. So. Many. Acronyms! After that meeting, I had my first opportunity to hear from the Affiliate Chapter Presidents, who gave us updates on the exciting things happening in their regions, such as the professional development and networking initiatives being planned for the year. It truly was a pleasure to meet these leaders in person and get a sense of their wealth of experience, their enthusiasm, and their solution-oriented approach to supporting their members. This year we’ve had a few online meetings, where we’ve used Tutela – and in one case, Zoom – to correspond. These types of online correspondence have taught me the benefits of online collaboration, and how it can be done efficiently, respectfully, and effectively. Acquiring online etiquette (such as timing your comments and minimizing distracting noises) took some getting used to at first, but I think I’m getting the hang of it. I was particularly grateful to attend a helpful board member orientation session in early 2018. Designed and led by our Chair, David Hazell, this informative session created an opportunity for me to dig deeper into the history, vision and mission of the organization and the foundational pillars from which we serve our members. All of my questions were answered, and I felt comfortable contributing to the discussion. When the orientation ended, I understood the more nuanced aspects of my roles and responsibilities as a board member. I also felt better equipped to contribute meaningfully to the organization with a more goal-oriented approach. This is all thanks to the kindness, knowledge and generosity of senior board members and executives who attended this meeting. I was pleasantly surprised to be matched with a mentor! Cheryl Fretz, the board secretary, kindly agreed to mentor me in spite of her extremely busy schedule as a dedicated and multi-tasking board member. She always patiently and calmly answers my frantic questions, and she clarifies any uncertainties I have about procedures and action items. Thank you, Cheryl, for always being there for me and handling my questions! When I think of this association – its executive team, its board members, and the volunteers and teachers who keep it going – I can’t help but think of leadership, expertise, and professionalism. Through our meetings and interactions this year, the board has welcomed diverse points of view while staying the course and remaining focused on our directives. There are, and will continue to be, challenges faced by all of us in our profession. Our association is adapting to curveballs as rapidly as the world of English language instruction in Ontario and Canada is evolving. It’s crucial for us to calmly and systematically respond to these challenges with our organization’s vision, mission, and strategic objectives in mind. At the end of the day, we recognize that our organization is about serving the needs and interests of our members, our volunteers, our teachers, our staff and administrators, and ultimately, our students. We aim to do this with integrity, respect, compassion, trust, and a commitment to excellence. My first year as a board member has shown me that the interests of all of our stakeholders are prioritized with every decision. My personal goal is to listen without judgement, take an analytical approach towards problem solving, and to consider all points of view. Through this consensus building process, my enthusiasm for this organization is growing alongside my appreciation for the hard work, generosity of spirit, and dedication of my colleagues in the organization. And through this, I have developed confidence and found my voice. I have also learned to listen better to others. This has been modelled by senior board members who have encouraged me to speak out and not be afraid to express my opinion. They have valued all my contributions respectfully, and, most importantly, have shown me the value of listening to – and respecting – a diversity of thoughts and opinions in order to work towards a common goal. Lara McInnis is currently on the TESL Ontario Board of Directors in the role of Member at Large.